A bus driver who was at the controls of a double decker which killed five pedestrians in Lincs has admitted causing death by dangerous driving. Stephen Topasna, 51, of Bridge Street, Louth, Lincs, admitted pressing the accelerator instead of the brake when moving out of a lay-by. The incident took place on a road outside the Fantasy Island resort in Ingoldmells in April 2004. Sentencing was adjourned but Topansa was told to expect a jail term. Joanne Warren, 37, and her sons, five-year-old Jacob and four-month-old Leyton, of Leicester, were killed when the bus ploughed into them. Fellow holidaymakers Paula Rhodes, 30, and her 33-year-old husband Richard, of Mansfield, Notts, also lost their lives in the incident. Lincoln Crown Court had heard Topansa had pressed the accelerator by accident but then kept his foot jammed on the pedal in a panic as the vehicle careered down the crowded road. His legal team had argued this effectively meant he had no control over the situation. But this defence was dismissed by a high court judge and Topansa subsequently admitted the five charges. After "leaping forward" from the lay-by, the bus crossed a pedestrian crossing at red and struck three people and a car before the fatal collision. Tests carried out by police later showed that by the time the bus at last came to a halt it had travelled 175 metres in 22 seconds. The court heard Topansa had been a bus driver for almost 30 years but had never before driven either the route or the Volvo model involved in the tragedy. 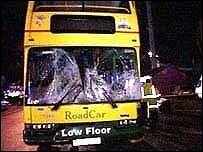 Earlier this month the company that owned the bus, Lincolnshire RoadCar, was found guilty of operating a vehicle with a defective brakes. The firm was fined £2,000 after magistrates in Skegness were told the "freak" fault did not contribute to the crash. It plans to appeal.